Copyright: ESA 2002. Illustration by Medialab. In nulling interferometry, light from a distant star (red beams) hits each telescope, labelled T1 and T2, simultaneously. Before the resultant light beams are combined, the beam from one telescope is delayed by half a wavelength. This means that when the rays are brought together, peaks from one telescope line up with troughs from the other and so are cancelled out (represented by the straight red line), leaving no starlight. 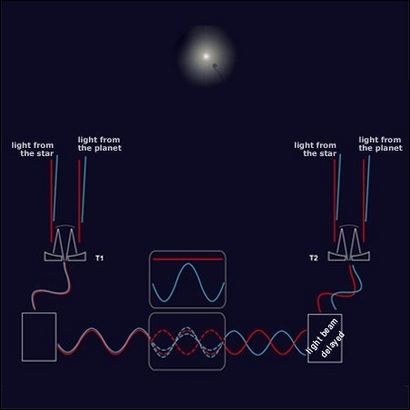 Light from a planet (blue beams), orbiting the star, enters the telescopes at an angle. This introduces a delay in the light reaching the second telescope. So, even after the half wavelength change in one of the rays, when the beams are combined they are reinforced (represented by the large blue waves) rather than cancelled out.